Altpick.com : News : Illustrator Barbara Kosoff creates a new piece for Scientific American Mind! Illustrator Barbara Kosoff creates a new piece for Scientific American Mind! 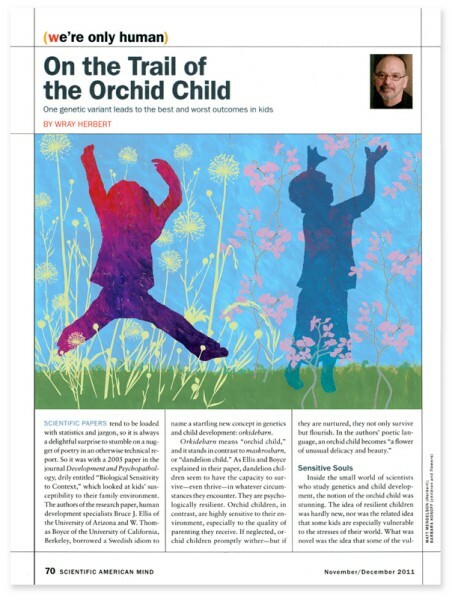 Scientific American Mind commissioned Barbara to create an illustration for their November/December issue for an article entitled, "On the Trail of the Orchid Child" - about how certain genes can lead to the best and worst outcomes in kids; hence becoming the "Orchid Child" or the "Dandelion Child".